Because it’s easy to build a single app which performs efficiently on numerous platforms. Like in iOS, Android & windows. The most important thing is you need, is a high-quality and advanced framework for mobile apps to build hybrid applications. There are two mobile application developments on which you can rely. Namely, native and hybrid app building. Hybrid development combines native code with independent code. This is suitable for multiple platforms. It allows creating cross-platform mobile apps. These applications fit any platform and function identically across different ones. Hybrid solutions require fewer efforts and provide accurate results. Specifically, you need to have only basic knowledge of standard languages. While development tools will do the rest of the work. Markedly, costs are reduced since only one team of programmers is required to develop and maintain an app. Significantly, hybrid frameworks provide near-native functionality. Web apps built using React Native are Facebook, Walmart, Uber EATS and Instagram etc. Moreover, React Native is open-source. Particularly, just write once and utilize react native UI components to an existing app code. No need to rewrite. It is prominent among hybrid mobile app development frameworks. CSS portions of the framework are enough to develop native looking applications. Moreover, the complete potential of the Ionic framework can be put to use if it is paired up with AngularJS. Significantly, there are a lot of features that you get like the integrated emulators and Cordova based app packages. Furthermore, support for Angular material design. Significantly, the Ionic framework is easily maintainable. Particularly it is an open source and free. This is the most stable and independent among the Hybrid Mobile App Development Frameworks. Furthermore, it doesn’t have any dependency on React or AngularJS. Moreover, it is an Open Source. Furthermore, it contains a lot of UI elements and widgets. Use a lot of animation. Significantly, it is totally free from license fee. PhoneGap is yet another open source hybrid mobile app development frameworks. Particularly, it is considered the simplest cross-platform framework. Creating applications with this tool is done all with Web APIs. In other words, it develops these applications under a wrapper native app shell. And then implements them in the native stores for various available platforms. Equally, it has a cloud service named “Build”. This compiles applications without the requirement of any SDKs installed on the environment. Furthermore, can be extended with native plug-ins and let you add more functionalities. It has its own significance among the hybrid mobile app development frameworks. Equally, Onsen UI is an open source mobile application development framework. It is well equipped to be used without the Angular JS requirement. It provides you the ease to build applications by putting together the native looking components as well. It is designed to use efficiently with a wide range of cross-platform tools such as Angular, Vue.js and React. Furthermore, it is a Desktop app. Moreover, it is simple to use. 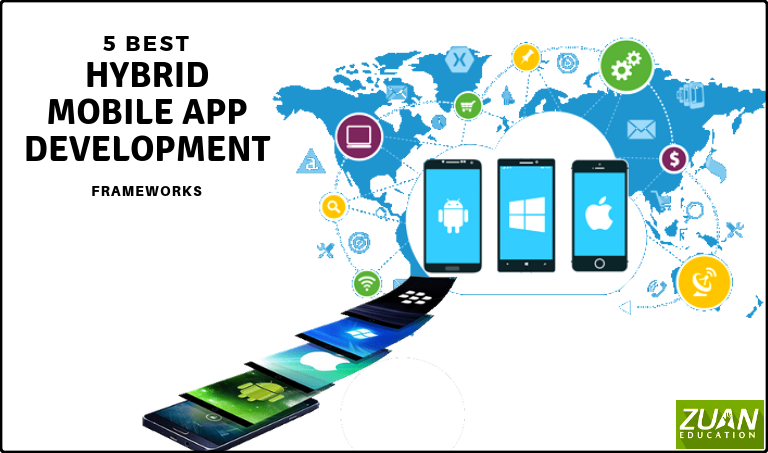 On the whole, the hybrid mobile app development frameworks fit for multiple platforms and allow creating cross-platform mobile apps. These frameworks is applicable on platforms such as iOS, including windows and microsoft.